Food is an essential part of our everyday lives. Food is responsible for the on-going building and repairing that our body requires. Often food is the centerpiece of celebration, especially our holiday traditions. It is my goal to provide a holiday menu that will not only be delicious but it will also nourish my guests. Both the deliciousness and nutritiousness of the meal will help us create wonderful holiday memories and give us the energy to enjoy this wonderful season. In our family we have people with various dietary restrictions, and I know that many under our care at Duggar Wellness also have restrictions. Sometimes these restrictions leave us feeling frustrated because we may not be able to enjoy some of our favorite holiday menu items. What would happen if you reinvented your holiday menu? I’m sure there might be the possibility of a family uprising, but what if they loved the new menu. Keep in mind every tradition had its debut year, and this year could quite possible be the debut year of a menu that lasts for years. Two weeks before your holiday feast, start gathering all your favorite holiday recipes and decide what you’ll make. Doing this so far ahead of time cuts down on stress and saves you time because you can shop before the shores get super busy. If creating a holiday menu is just too much for you this year, borrow mine. There are links to the recipes below and you can even download the complete menu plan and shopping list too! Shop: About 4-5 days before your holiday feast, do all of your shopping. Many grocery stores now offer grocery pick-up or home delivery. Take advantage of this service if it is available in your area. This is one of the best time saving options and it also saves you from those impulse purchases. Chop: Meal propping ahead of time will make the day of your holiday feast so much more relaxing. If you have kids with knife skills, put them to work peeling and chopping the produce. You can also precook any veggies that will be blended up into soup. For this particular menu that I have listed, I would prep and cook all the veggies for the Roasted Butternut Squash soup, chop the veggies for the Yellow Rice Pilaf as well as the carrots. Veggies generally last longer in the fridge after they have been cut. Fruit will not so I like to save that for the day of the meal. 2 days before the meal is a good time to prep the details. By this I mean get all the sauces, dressings, spices mixes and garnishes prepared. For the menu plan listed below I would complete the following: caramelize the pecans for the salad, make the salad dressing, cook the rice for the rice pilaf as well- it can easily be heated up when you prepare the rest of the pilaf ingredients. If I need to make some spice blends I will do that at this time too so that when I’m cooking the day of the meal I won’t need to stop at time time for that. The evening before or the morning of the feast I like to prepare the dessert. This will give my bundt cake time to cool before I frost it. My biggest advice on any of these steps is, Don’t Do It Alone! Enlist the help of your family, assign others to make a certain part of the meal, most of all don’t wear yourself out trying to do it all alone. The night before our holiday feast I like to spend time setting the table. Special occasions are a great time to make the table a little more special too. Maybe you have some fancy dishes, or cloth napkins, a decorative center piece or even candles. Taking time to prepare a nice environment at the table will make your meal memorable and extra special. Here is my Christmas menu. If you think your family might enjoy this menu I’ve included a complete shopping list below. If you think something a little more traditional might sound good, you can find our other favorite holiday recipes in my Holidays from Scratch eBook. I love the idea of a full course meal, but sometimes that seems like way too much food. 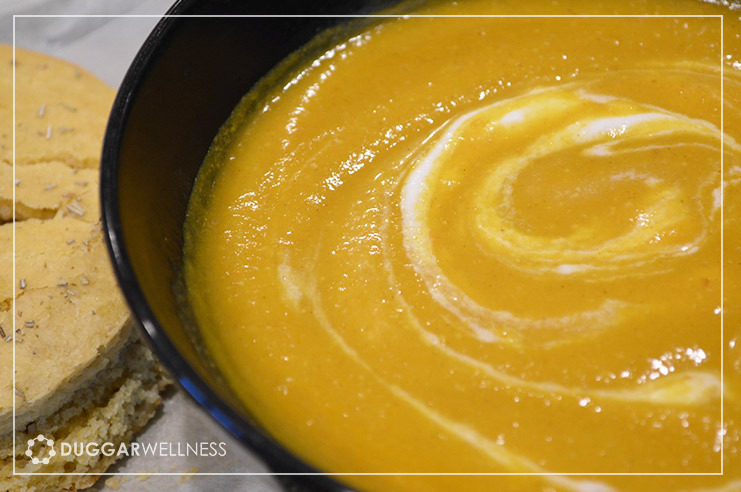 Serve your soup in a little cup sized serving so it warms up the palate for the rest of the meal. This salad just tastes like Christmas! Fresh, in season, pears and dried cranberries tossed with Caramelized Pecans and Cranberry Vinaigrette dressing. Take your plain rice and turn it into a delightful combination of healing herbs and spices. Savory turmeric makes this rice yellow and toasted pine nuts and dried cranberries give new flavor and texture. This is one of our family favorites. This is the best way to get both kids and those grown-ups who don’t like veggies to eat something with color. We’re passing on the traditional Turkey or Ham for our Christmas dinner and indulging in some wild caught salmon. This gluten free cake is soft and moist with a hint of pumpkin spice.